Relax. We’re on the job. Our technology tools are powerful and easy to use, our support staff is constantly accessible and consistently professional, and our travel solutions keep your people moving in the right direction. Always on and constantly connected, our team of tenured associates is dedicated to your company’s account, providing the lowest fare on domestic and international airline, hotel, rental car, rail and ground transportation. 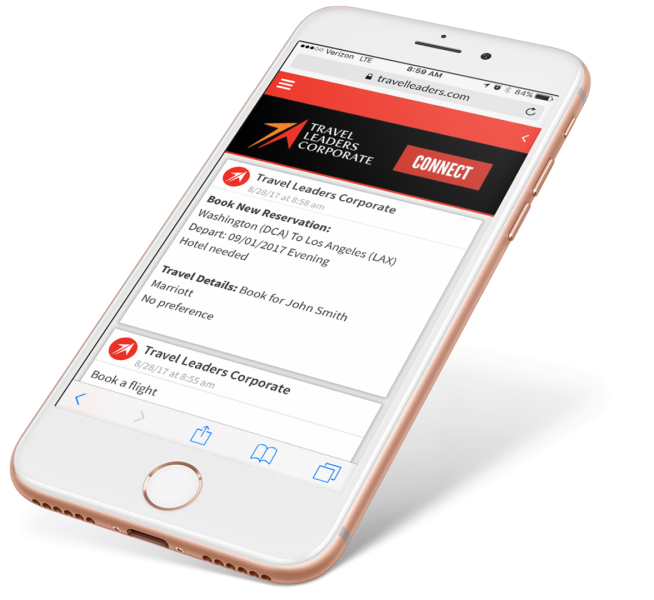 Our proprietary platform—Travel Leaders CONNECT—puts our travel professionals conveniently at your fingertips through mobile chat and your phone’s native SMS client, all while delivering a feed of actionable disruption alerts and providing an easy source for hotel, air and car rental bookings. Get connected here. A customized website, built specifically for your company, empowers your travelers to book and manage their itineraries online, all through an intuitive Web interface and mobile app. The ability to govern approvals, manage supplier discounts and enforce best practices brings visibility and order to your reservation process. A single point of contact for all of your program needs, a dedicated manager will use benchmarking, KPIs and metric-based reporting to deliver timely strategies to leverage your travel spend. Automated low-fare monitoring and preferred seat alerts give your travelers more choices, while unused ticket tracking streamlines cost reclamation efforts. Additionally, our powerful Web reporting platform provides your company with a constant stream of smart data to help you make the most informed decisions. We use our considerable buying power to provide your company with the most advantageous discount opportunities available. Plus, thanks to our long-lasting relationships with airlines, hotels, rental car and ground transportation, we have access to rates not available to the public.